So today Isabelle, Jane and I went on a fieldtrip to Niles, Mi with our sweet friends Kris, Mikey and Del (in fact, today Del turned 2! Happy Birthday, little guy). 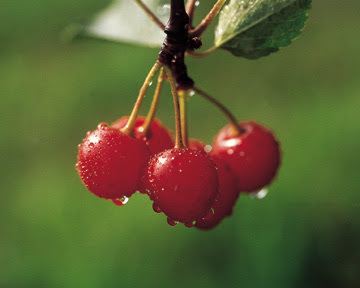 Anyway, we picked cherry after sour cherry - eating them, squishing them and dribbling them all over our clothes. The kids were bored quickly, and chose instead to play "Sleeping Beauty" in between trees. That left Kris and I to fill our enormous buckets by ourselves. Luckily the weather cooperated - neither raining nor blazing hot - and within a couple of hours, we were rinsing them in big metal buckets and waiting our turn at the pitter (yes, free pitting) what could be better! Now, hours later, I'm cherrying it up - jam, pie, even a sour cherry martini to start the evening off in style!. Nothing's turning out too well - I mean, I really prefer wine to sour cherry martinis and the jam looks both too runny and too chunky at the same time, but hey, these cherries came off the tree today! They weren't shipped from goodness knows where, sitting on a truck for days and touched by who knows how many hands. No way. So visiting Lehman's Tart Cherry Orchard clarified something for me. In all honesty, it was not just the Orchard, but rather a heartfelt conversation with Molly, countless brainstorming sessions with Zach and a quick catch-up conversation with my talented artist sister, Bethany. Regardless, our little business (maddex media relations) is refining it's approach. What I want to do - what really energizes and excites me, is encouraging others. Weird, right? but what I want to do it promote the underdog. Any small business, artist, author or friend who needs help promoting their work. Fortunately Zach is technologically and mathematically skilled. With the installation of our new programs (the Adobe Creative Suite along with Dreamweaver and the new microsoft office) we are preparing to offer professional graphic design services. Hmmm - if only we knew an artist/photographer that needed a job...(Just kidding, Bethany, you can do freelance work for us where ever you are). This doesn't mean that I don't want to become the premier Orthodox Christian Publicist, I do! It's just that I think that will unfold in time. I'm building contacts, logging experiences and learning about book promotion. In the meantime, however, Sander's Dairy Farm sells fresh milk, local honey and Amish butter. They just opened a store and we need to get the word out! My dear friend Kris is an amazing florist. Although she's busy making cheese, ruhbarb soda and parenting four kids, her beautiful arrangements have made a name for herself. She's quite talented and is taking clients! The wedding arrangements she does are fabulous! Just check her blog. All in all, this is just a great time in my life. Cooking, gardening, encouraging my friends and community, learning about my girls and how to parent them - these are fun and interesting endeavors. Stay tuned to see this reflected on our website! I'm excited all over again just reading your post. I love that you love to encourage others and to grow stuff and to make homemade cherry everything! It is truly a blessing to know you. Thank you, Molly. I love your new site - it really does look good.